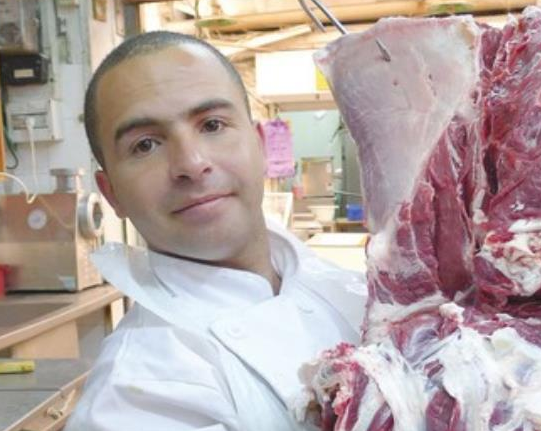 Ya’acov Mizrahi is the 72 year old owner of a butcher shop in the shuk, where he cuts and sells quality beef. His family came from Iraq, but he was born at Hadassah Hospital on Mount Scopus. He runs the business with his son Nissim, who is the third generation in the business, and his assistant, Mohammed Gilani. Gilani is from the Golan Heights. He moved to Beit Hanina 13 years ago, a very prosperous, as he says, “relaxed” Arab community north of Jerusalem, where he lives with his family. Seven years ago he began to work for the Mizrahis. His family is also involved in the meat business, so he was familiar with the art of cutting meat. Ya’acov, how old is your business? Since 1948 my family has run a meat business. I grew up in Nahlaot, in the lower part. Today I live in Gilo with my family. We moved the business to our present location 12 years ago after selling a previous meat business that also operated in the shuk. This street is known as the street of fresh meat. This is a family business, but is it only you and your son here now? I have three sons and three daughters. I wouldn’t have chosen for all of them to work here. Nissim learned this skill from me, and I learned it from my father, Yonah Mizrahi. Nissim has been working here for about 10 years. We work together six days a week. How does the process work and where does the meat come from? I purchase the meat from people I know in Holon. They supply me with good-quality meat, and I have a personal connection with them. It isn’t a question of looking for new suppliers all the time; I know the people I buy from. They are reliable, and I have a good connection with them. We usually receive two cows a week, which we get after they have been koshered. They come whole. We receive them like that, and they go into the cooler. Then we cut them up, usually on Monday and Tuesday. Sunday is a slow day. We work half a day, something like 10 in the morning to 2 in the afternoon. Did you ever think of also learning to be a shohet [ritual slaughterer]? No, we receive the meat ready. Koshering the meat is a complicated and special process. We receive it after that. Is it hard to learn to be a butcher? Not especially. I learned it from my father, and Nissim learned it from me. You sit here on an entire street of people who sell fresh meat. How do you differentiate what you have from what they are selling? Each person, each customer, is different. They each want something different. They come to us because they know us or they choose us. A butcher is like a hairdresser – you get used to a certain place, and you keep going back. We don’t make an effort here to fight it out for business. There is enough business and enough customers, and they make the choices they make. We have our own clients who come, and they know what they want and they choose our place. What is the most popular cut of meat? The steak, to be sure. It is priced at NIS 150 a kilogram today, but that changes from week to week depending on what we are paying. On holidays where a lot of meat is consumed, such as Independence Day, the price goes up considerably. But not every Israeli can afford to have steak all the time. Right, so some prefer other parts. The leg, the sides, the chest. Those cuts are much cheaper, about NIS 35 a kilo. What has changed during the time you’ve worked here? In the old days you couldn’t just go to the supermarket and buy meat. If you wanted fresh meat in Jerusalem, you came to the shuk. Nowadays not only do the supermarkets have their own fresh meat that is cut to order, but everyone also sells frozen meat. What about the future of the shuk? Where is it going? I don’t think there will be a shuk as we know it today. In 10 years it will be coffee shops and pubs. The building will still be here, but not the shuk.